Halve and seed 1 pie pumpkin (pie pumpkins are much smoother and tastier than jack-o-lanterns), add a 1 inch chunk of peeled ginger and Roast for 90 min at 350F. Toss 1-2tbs olive oil with the pumpkin seeds, spread over a baking sheet, salt to taste and roast for 45min at 350F (at the same time as the pumpkin halves) for a delicious snack. 2 cups pumpkin (1 lb.) 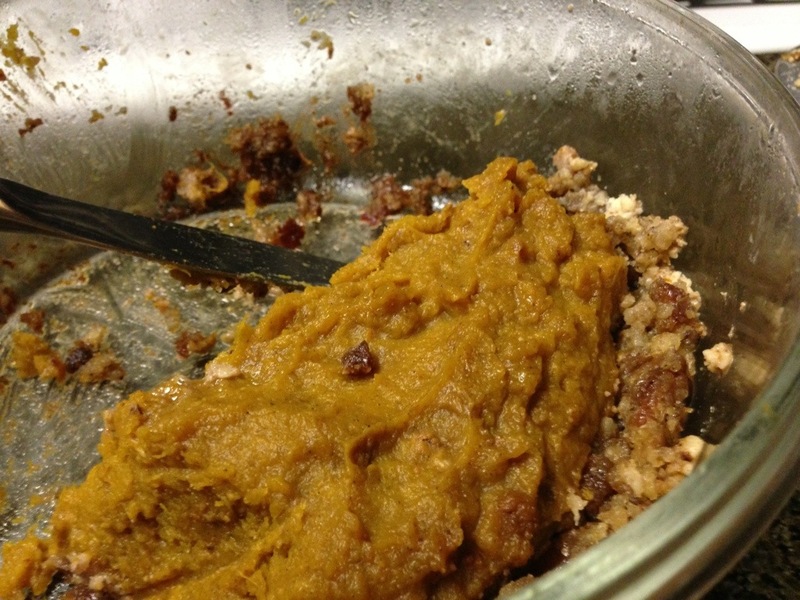 – roasted, puréed (Solid pack pumpkin may be used, but the texture and taste isn’t nearly as amazing. Press mixture into pie pan or large pyrex (or any oven safe) glass storage container. Combine the warm milk and melted butter. Pour over the sugar and stir until there are no grains of sugar remaining. Stir in the remaining ingredients, mixing the filling thoroughly. Pour this into the prepared pie crust. Bake at 350 for 35 minutes and enjoy! Alternative option to baking in a pie dish: Place in individual ramkins, they can even be decorated festively. This pie doesn’t hold together as well as a gelatin filled store bought one, but is so much tastier. This entry was posted in Eats! and tagged ginger, no bake crust, Pumpkin pie, whole foods by cutspark. Bookmark the permalink.